This weekend we face the sorrowful serious illness of Zelda, the 16-year-old dog who has been with me, my kids, and the Love of My Life through many of life's adventures. Stories and poems about her have appeared in my book and my blogs, and she has her own loving group of fans. 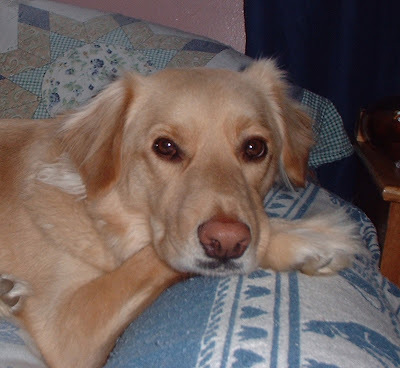 As we go through this very difficult time that is inevitable for any pet parent, I'd like to share one of the stories about Zelda and the other dogs who have shared my life. All brought me joy, happiness, and at times, crazy adventures. This dog tale appears both in my book "Treading Water" and in "Dogs: Heart-warming, soul-stirring stories of our Canine Companions," edited by John Cali. A few days ago, my 10-month-old puppy, Zelda (who, yes, like F. Scott Fitzgerald’s wife, must, on a regular basis, be locked up) decided to take an unauthorized tour of the neighborhood. She escaped from me as I was attempting to put her outside on her chain. I had just gotten home from work and was still dressed in my work clothes, complete with pantyhose and red high heels. As she dashed down the driveway and across the street, I followed her as quickly as possible, a demented Dorothy in ruby slippers trying to retrieve a very poorly behaved Toto. Zelda was not trying to run over the rainbow, but rather indulge in a neighborhood-wide game of “Chase.” Looking over her shoulder she would let me get almost close enough to touch her, and then she would bound out of reach. It was a great entertainment for my neighbors, who, for some reason or another, were reluctant to join in the game. Well, it could be the fact that Zelda often appears with a muzzle on (a vain attempt to discourage constant barking and grass-eating) or perhaps the huge Beware of Dog sign on my house, meant to discourage unwanted visitors when I am not home. Having this puppy in the house brings back memories of all the dog mischief I have been subjected to my entire life. Now some families are not dog families and cannot comprehend why we are willing to subject ourselves to this. To those families all I can say is — you haven’t lived until you come home to find your house has been gleefully redecorated with the fragrant contents of your kitchen garbage can, or the family is reduced to sitting on folding chairs to watch TV, because, the couch belongs to the dog. However, if you are a dog family, you understand that the joy and companionship far outweigh the chewed up camera straps and stained carpeting. And the stories of the dogs that spend their lives with you become the stuff of family legend. The dog that I grew up with was a good-natured Bassett hound named The Red Baron. A show dog with a championship bloodline, I occasionally would show him in the Junior Showmanship section of American Kennel Club dog shows. But unlike the professional dogs who arrived in crates with fancy grooming tables, Red would ride in the car like one of the kids, his paws resting on the back of the front seat and his nose constantly knocking off my father’s hat. This was also the lazy, slow moving dog who, at the mere mention of bedtime, would be off like a shot, flying up the stairs as fast as his short little legs would carry him. If you weren’t able to catch up with him, he would jump in your bed first; settle in the exact middle with his head on the pillow, forcing you to sleep, blanketless, on the edge. Later, as a single young woman living alone, I felt the need for a dog not only for companionship but protection. This was naturally what I was looking for when I fell for a miniature dachshund in a pet store. I named him Max, after the song Maxwell’s Silver Hammer. I can’t explain why I felt the need to name my dog after a musical serial killer; however, I think he took it very seriously. Max was the only schizophrenic dog I have ever had, and all I can say is, thank goodness he only weighed 5 pounds. At certain times, Max would station himself under a chair and attack anything, including my feet that passed by. Attempts to clip his nails induced a mania that required 3 people to control. And once, while romping in the yard at my parent’s house, he bit down on a stick so hard, the ends snapped off, leaving the middle of the stick firmly lodged against the roof of his mouth. It took the entire family to hold him down, open his mouth and yank out the stick. He promptly rewarded my father by sinking his teeth into his hand. Biting the hand that fed him was Max’s hobby. Gypsy was the dog who served as the “first child” when I was married. A devoted and well-trained German shepherd she was popular in our circle of friends. But friends are in short supply when your dog goes out in the yard and meets a skunk. No one wants to come over and help you douse her with tomato juice, orange juice, baby powder and vinegar. Kids run away screaming, slamming their bedroom doors and yelling “she’s not sleeping in here tonight!” So much for all her years of loyalty. So, now we have Zelda. Born in a junkyard and bottle fed by a kindly family who rescued her from a malnourished mother, Zelda still feels the need to be cuddled and held. The problem is, she is almost 50 pounds, with a tail that would be more appropriate for a horse. Days and nights are spent keeping her body off the furniture, her paws off guests, her head out of the fishbowl and her tail away from anything not nailed down. Her extreme distractibility means that she often takes a drink of water, forgets to swallow it, and proceeds to dribble it all over the first person she encounters. I’ve been trying hard to come up with a solution that keeps Zelda occupied and doesn’t involve house demolition. Finally, yesterday, I turned down a road I don’t usually take, and passed a huge facility called Canine Academy. There, behind sturdy, tall fencing was an elaborate dog obstacle course, complete with things to jump over, squeeze under, crawl through and run around. The perfect place for Zelda and her Olympic-style dog tricks. I made a mental note to call the school right away and get information on how she can join in — just as soon as I catch her.